The Invacare Kite is unique in performance, driving comfort, compactness and personalisation. Designed for active individuals, this remarkable chair has a compact design making it ideal for outdoor activities and comes with a wide range of colour options. Its Dual Swing Technology (D.S.T. )®, provides a unique suspension system to guarantee a superior driving experience with improved comfort and traction. The Kite is unique in terms of performance, driving comfort and compactness. Dual Swing Technology (D.S.T. )®, large front and rear wheels and an exceptionally compact base enable a smooth outdoor performance during everyday activities. The Kite is truly modular and can be precisely configured. Choose from a selection of seven stylish shroud colours combined with two frame and three rim colours to personalise the powerchair. 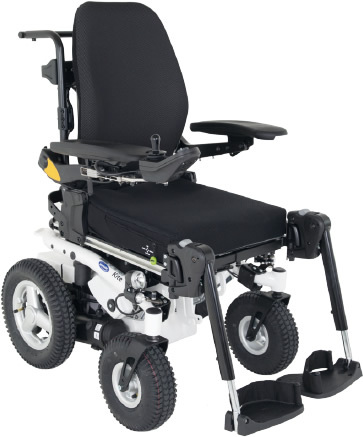 The powerchair features large batteries for increased range, 4-pole motors and 120A power module. The Kite boasts the very latest Invacare technologies, including SSD-motors, G-Trac and Dual Swing Technology (D.S.T. )® suspension system. The optional smooth-drive front castors are set to further improve and allow for an exceptionally smooth and comfortable ride. If you have any questions at all regarding the Invacare Kite or would like to book an appointment to be assessed please do not hesitate to contact us on 0330 0581 008 (Local call rates apply) or FREE PHONE 0800 626 829 or complete the form on this page and we will get back to you.